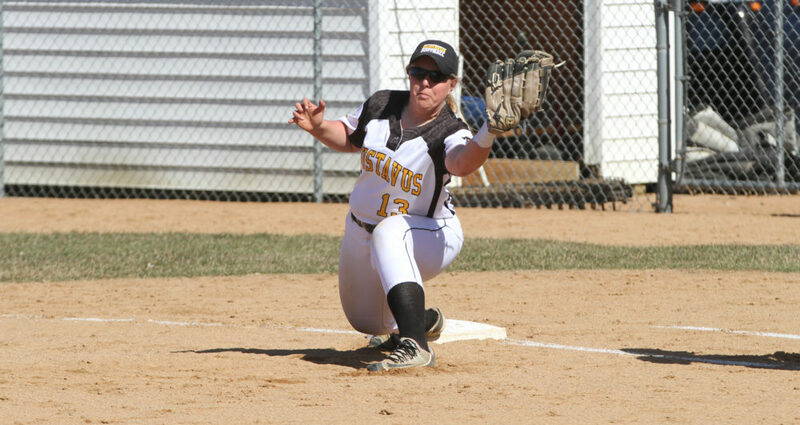 NORTHFIELD, Minn. – The Gustavus softball team ended its season Sunday on a high note, sweeping Carleton 4-2 and 8-2 to finish the year 12-24 overall and 8-14 in the MIAC. Pitching and defense were keys to the victories as the Gusties did not commit an error and allowed just 12 combined hits. After four scoreless innings, the Gusties broke the shutout in the fifth with a pair of runs on a two-run double off the bat of Kim Kurtzweg (Sr., Arlington, Minn.). The Knights answered with a run in the bottom half with a run-scoring single to make the score 2-1, but the Gusties came right back in the sixth with two more runs. Taylor Shortly (Sr., Forest Lake, Minn.) singled to right field to plate the third and fourth runs of the game. Carleton scored its second run in the sixth, but it was too little, too late as the visitors held on for the win. Aly Freeman (So., Omaha, Neb.) went the distance in the circle with two runs allowed on four hits. She struck out five and walked one. Kurtzweg led the team at the plate, going 2-for-4 with two RBI. A five-run second inning proved to be enough for the Gusties as they ended the season with a decisive victory. Shortly, Kurtzweg, and Ashley Beise (Jr., Loretto, Minn.) each had an RBI in the frame, which featured three hits and two Knight errors. Gustavus made it a 7-0 advantage in the fifth as Freeman scored on an error and Marissa Marsolek (Fy., Savage, Minn.) later knocked in a run with an infield single. The final Gustie run came in the seventh as Beise hit an RBI single to left. Carleton scored one run in the fifth after two hits and another in the seventh on a pair of hits as well. For the second straight game, Freeman went the distance on the mound, allowing two runs on eight hits with a strikeout and two walks. Five Gusties posted two hits apiece as the team combined for 12 hits.